Our custom party wear products for baby showers include badges, rosettes and sashes. 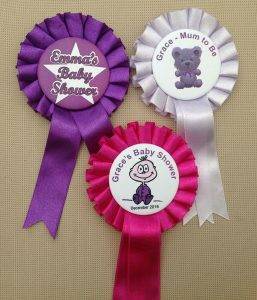 Our Baby Shower Rosettes are available in all colours – but the most popular are pink and blue. Whether you opt for rosettes or badges, then you can have a rosette just for the Mother to Be, or you could expand this to include other family members. Here you could have ‘Grandma to be’, ‘Auntie to be’ , ‘Big Sister to be’ or whatever combination of names you wish. Of course you can also expand the range to include all guests at the party. For our Baby Shower rosettes, you can choose a different colour or wording for the Mum-to-Be. There is no extra charge. You can also change the wording for other members of the family – such as ‘Grandma to be’, ‘Auntie to be’, ‘Big Sis to be’ etc. Either call us, email us or add your comments on the order.